Before one starts paving anything, there are many factors that have to be considered before beginning. One has to decide what the overall look of what you are paving should be and to make sure it matches with its surroundings. Aside from that, one has to consider what exactly they are paving. A lot of the elements change can depend on the project itself based on what exactly is being paved. One of these elements is the paving material. Although you have free reign over the creative side of your garden’s paving plans, you should be careful with the paving materials that you choose. 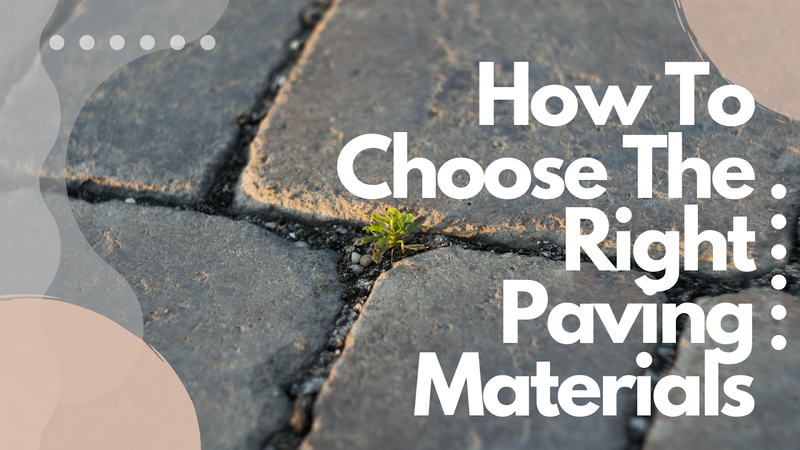 If you have no clue what paving material to choose, then read this guide on how to choose the right paving materials for your garden. Which Patio Paving Material To Pick? One can be surprised to note that there are many choices to choose from when it comes to patio paving materials. The burden of choice may lead to analysis paralysis making one unable to make a choice at all. To help guide you in making the right choice, do consider several factors first. One, consider the weather in your area. Make sure that your paving material of choice is able to last no matter what weather conditions come down on your home. Aside from that, do consider how much pressure the paving material will be experiencing. Whether it will be dealing with a lot of foot traffic or the weight of cars, some paving materials are better for withstanding pressure than most. Lastly, do consider your budget. Some paving materials will definitely cost more than others due to multiple factors. Identify how much you are willing to spend, especially if you might have to buy extra paving materials than initially thought. On that note, which patio paving materials are available out there and what exactly are their qualities? Sandstone paving is one of the cheaper options out there as a paving material. It is an attractive paving material given its ecru or sandy hue, hence the name. Aside from that, it is known to have these subtle changes in its shades that make for a pretty pattern. This kind of paving is durable enough and, when well-maintained, can last for a relatively long time. It is environmentally-friendly and is biodegradable too, so it is a greener choice for a lot of people. Sandstone paving can also be easily shaped so if you are looking to customize this, then you will have an easy time doing so. On that note, its softness also means it is quite prone to dents so do take note of that. Sandstone paving is not recommended for areas that get rained on frequently. This paving is porous so it can absorb water so during rainy days, it can get water damage and can be slippery. Also, its porousness makes it dirty faster than other paving materials. Speaking of cheap paving material, gravel is another affordable paving material option for your patio. Although there are higher price tags for other gravel variants, it is still relatively cheaper than others. Aside from being relatively cheaper than other paving materials, it is also easier to install. Plus, you will not have to worry about drainage issues of gravel. All of these pros are the reasons why gravel is a popular choice for patio pavements. Although there are many benefits to using gravel as paving material, there are also downsides to this. One issue that people have with using gravel for their garden paving is that it tends to accrue weeds easily. Aside from that, gravel is an inexpensive choice and it shows. It is not the most attractive of paving options and is best used for more informal-looking gardens. The weeds that may sprout around it do not help too. Before using gravel, do make sure that you keep the design in mind because a polished home with gravel paving in the patio may not suit well if carelessly used. Slates are a more expensive paving material choice for your patio, however, they offer numerous benefits to people. One benefit to using slate as a paving material is its attractiveness. Its deep blue colors and soft texture make for an attractive look in your patio. If you are looking to up the look of elegance in your garden, then Slate is a good choice for that. Aside from that, slate absorbs less water so it won’t suffer from any water damages. Aside from that, it won’t receive as much damage as other paving materials when it comes to chemical spills too. Although this is the case, it is not too good in weather conditions that change from freezing to thawing patterns. This type of weather condition can chip away at this paving material so this may not be the choice for people who live in this kind of weather. All the previously mentioned paving materials are lacking in one aspect that Granite paving material addresses really well. This aspect is durability. It is very weather-resistant and is a strong material. Given this fact, it is much more expensive than the other options. Aside from that, its durability makes it hard to shape. Other benefits that Granite paving material provides is its numerous color options. With these color options, you have great design scheme options for your garden paving thus making granite a great way to accentuate your garden. Another popular paving material for your garden is concrete. Much like Granite, Concrete paving is a durable paving option that can survive for a long time no matter what the weather conditions are. Aside from durability, concrete provides a lot of stylistic options for you to choose from. Whether you are looking for a different color or textures, concrete provides a wide range of style choices for you. Durability is not the only thing that it has in common with Granite. It is also not the most affordable option out there. Aside from that, it can be difficult to maintain as well because it is a porous material. Bluestone is a more expensive variant for a paving material in this list. Due to the difficulty of the instalment, Bluestone costs more than your average paving material. Although it costs a lot, Bluestone paving material is a great addition to any patio because of its timeless elegance. It can match well with anything and can withstand considerable foot traffic. Do note, however, that it can still get dinged up. Plus, Bluestone stains quite easily and may also need a sealant so take this into consideration when choosing Bluestone. There are many choices of paving materials for your patio and the right one will depend a lot on your environment, needs, and your tastes. Read through the listed paving materials above and identify which elements match well with your needs. Paving materials are an important aspect of an attractive home. If you are looking for durable and attractive paving materials, http://www.firth.co.nz/ can help you get the right paving material for your home.